Sub: SE. SCERT, AP- Orientation course for in-service teachers in the months of December - 2017 to February -2018 -Deputation of ten in service teachers- Reg- Reg. Ref: Lr. No.CCRT/ 13011 / 1/2017/7845, Dated: 17-11-2017 From Deputy Director, Center for Cultural Resources and Training (Under the aegis of Ministry of Culture, Govt. of India). White enclosing a copy of the reference read above, all the District Educational Officers in the State are informed that the CCRT, New Delhi has informed that the CCRT will be organizing an Orientation Course for in-service teachers in the months of December - 2017 to February -2018 and requested to depute Ten (10) teachers from middle/secondary/senior secondary Govt. /Govt. 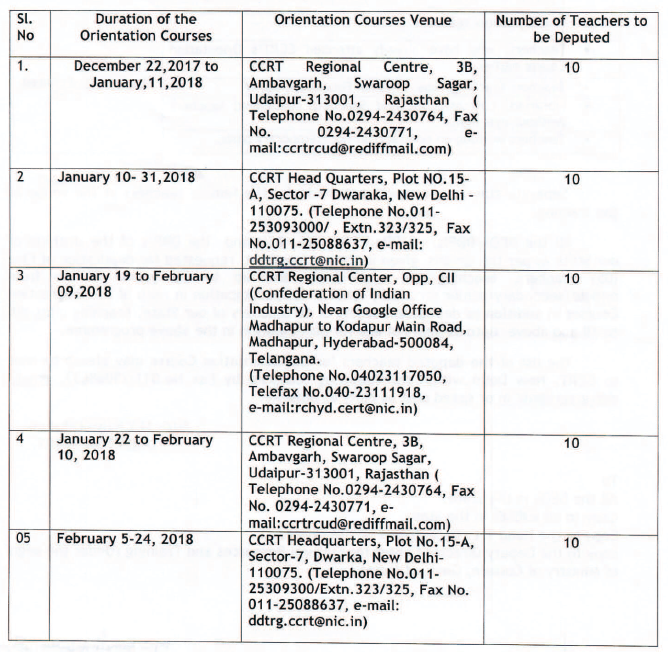 aided schools of our State, teaching class VIII and above upto 52 years of age, for participation in the Orientation Courses to be organized by CCRT as per following details. respective Orientation courses mentioned above. 2. Teachers must be teaching in minimum any one of the following Classes 8th,9th,10th,11th/12th of middle/secondary/senior secondary schools should only be deputed. 5. The deputed teachers should have minimum two years’ experience of teaching. 6. Only one teacher for one school should be deputed in the above mentioned Orientation Course, not more than one teacher from the same school will be allowed to participate. Separate stay arrangements are made for the female teachers at the venue of the training. All the DEOs/DDPIs/IOS/DDs/CEOs/CIOS, BEO and the DRP’s of the districts of our State as per the details given in the enclosed list, requested for deputation of Five (05) teachers, teaching VIII and above and up to 52 years of age from middle/secondary/senior secondary schools for participation in each of the Orientation Courses in addition to deputation orders of 10 teachers of our State, teaching class VIII to XII and above upto 52 years of age for participation in the above programme. The List of the deputed teachers for the Orientation Course may please be sent to CCRT, New DeLhi within the following schedule by Fax No.011-25088637, emaild dtrg.ccrt@nic.in or speed post as early as possible.